The Press in the Arab Middle East: explores the press as a Middle Eastern institution during its formative century before World War II and the circumstances that shaped its growth, tracing its impact, in turn, on local historical developments. الكتاب العربي المطبوع : من الجذور إلى مطبعة بولاق / تأليف د. خالد عزب، أحمد منصور. Selected list of journals and newspapers, arranged chronologically by date of publication. 1828 Al-Waka'eh al-Masriya The first & official Egyptian Arabic newspaper. 1858 Hadikat al-Akhbar - حديقة الاخبار Founded in Beirut by Khalil al-Khoury. 1860 Nafir Suriyah - نفير سوريا Founded by Butros al-Bustany. 1861 Al-Jawaib - الجوائب Founded by Ahmad Fares al-Shidyaq. 1870 Al-Bashir - البشير Founded in Beirut by the Jesuits. 1875 Al-Ahram - الاهرام Founded in Cairo by Lebanese brothers Bishara and Salim Takla. 1875 Thamarat Al Funun-ثمرات الفنون Founded in Beirut by Abdel Kader Kabani. 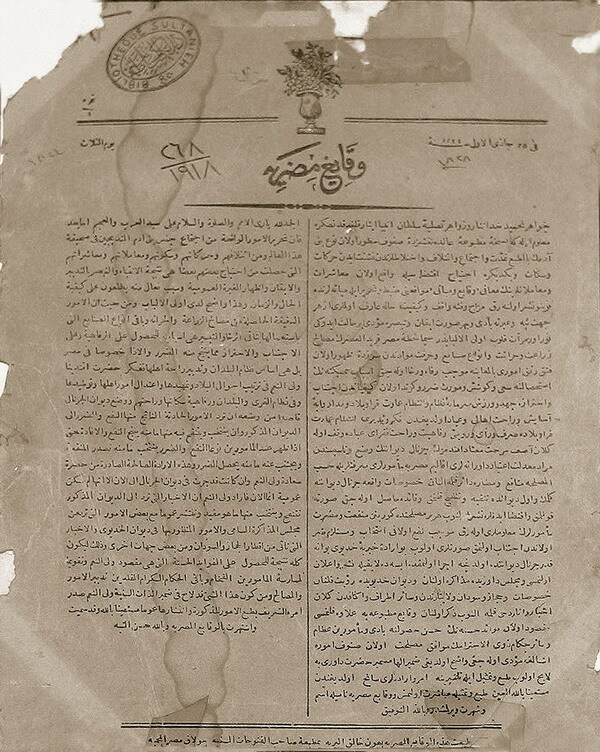 1876 Al-Muktataf - المقتطف Scientific journal, founded in Beirut by Yakoub Sarrouf and Fares Nemr. 1877 Lissan al-Hal - لسان الحال Established in Beirut by Khalil Sarkis. Still published in Lebanon. 1880 Al-Misbah - المصباح Political, scientific and literary newspaper, founded by Nicolas Naccach. 1881 Al-Taqaddum - التقدم Founded in Beirut by Youssef al-Chalfoun, Adeeb Ishak & Youssef Debs. 1883 Al-Hadyah - الهدية Bimonthly magazine, founded in Beirut by Jamiyat al-Talim al-Masri. 1884 Al-Tabib - الطبيب Founded in Beirut by Ibrahim al-Yaziji, Bichara Zalzal and Khalil Saadeh. 1886 Assafa - الصفا Founded in Alley (Oubey) by Ali Nasreddine. 1888 Al-Mukattam - المقطم Founded in Cairo by Lebanese Yaakoub Sarrouf and Fares Nemr. 1891 Lubnan - لبنان Political newspaper, founded in Beirut (Baabda) by Ibrahim Aswad. 1892 Al Hilal - الهلال Founded in Cairo by Gergi Zeidan. 1897 Al-Manar - المنار Literary and scientific newspaper, founded in Beirut by Mohammad Rashid Rida. 1898 Al-Machriq - المشرق A catholic magazine, founded in Beirut by father Louis Cheikho. 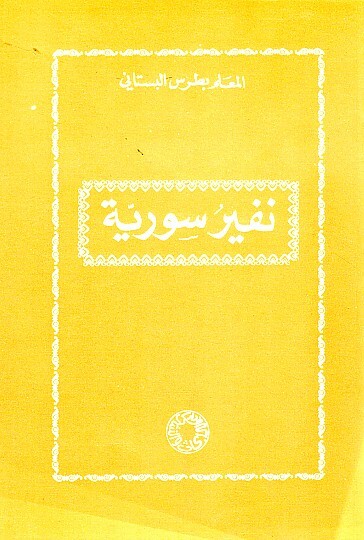 1899 Al-Mahabba - المحبة Published in Beirut by Jamiyat al-Talim al-Masihi al-Urthudhuksiyah. 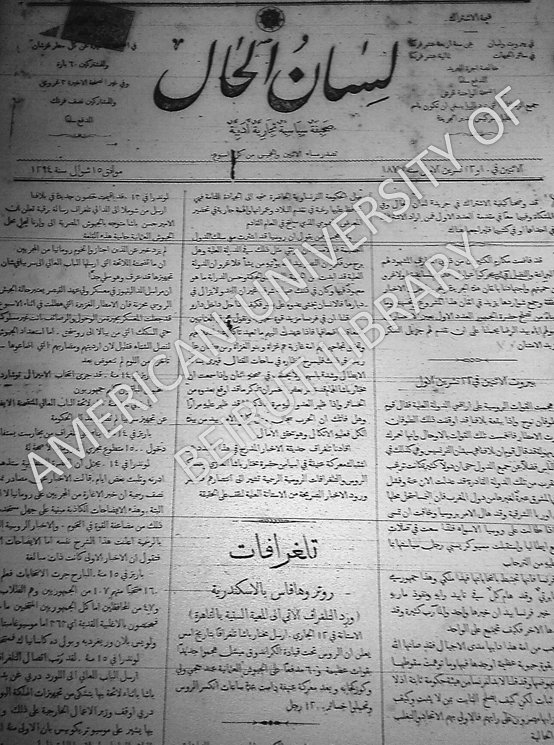 1908 Al-Barq - البرق Literary newspaper, founded in Beirut by Bechara el-Khoury. 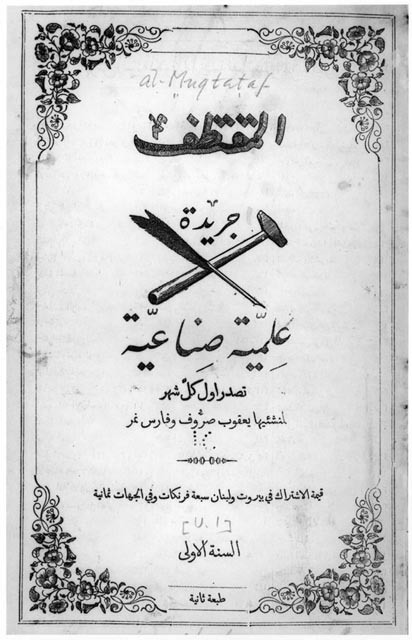 1909 Al-Irfan - العرفان Political and cultural magazine, founded in Saida by Ahmad al-Zein. 1911 Al-Balagh - البلاغ Founded in Beirut by Mohammad al-Baker and Nassouh Bekdash. 1911 Al-Hawadeth - الحوادث Political Journal, founded in Tripoli (Lebanon) by Lutfallah al-Khalat. 1914 Fetat Lubnan - فتاة لبنان Literary & scientific magazine founded in Beirut by Suleima Abi-Rashed. الصحافة السورية ورجالها : "اعلام... وأعلام"
نشأة الصحافة العربية بالاسكندرية 1873-1882 م.